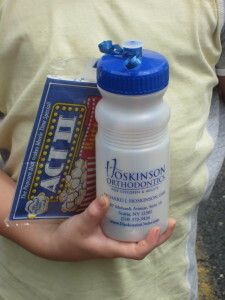 On July 3rd, J’s palate expander was removed. Since, umm, December, I think, J’s had an appliance affixed to the roof of her mouth, which meant that eating popcorn or sticky items like caramel or Tootsie Rolls was forbidden. J took these dietary restrictions very, very seriously. I had never noticed how much popcorn folks doled out at school, with friends, and just about everywhere until it wasn’t allowed for J. And it was a bummer with every trip to the movies. J was an excellent orthodontia patient in general, remembering (usually) to wear the removable bottom palate expander each night and remaining as still as possible when I’d have to use the little key to widen the arch of her teeth. This didn’t hurt, but pretty much every time I tightened the top one, it made her gag. In fact, when we first started doing it I didn’t always turn the key enough, and eventually we figured out that if I turned until she gagged, we’d done it right. J will still be wearing the bottom expander nightly and soon she’ll have a retainer for the top, too. But the important thing is, she’s free to eat with wild abandon! Whoo, hoo! The orthodontist started the party with a bag of microwave popcorn and a water bottle filled with all the most horrible, stickiest candies available. Within 24 hours, J ate microwave popcorn from the pool snack bar, Cute W’s delicious caramel corn, and genuine movie popcorn when we all went to see Despicable Me 2. Which we all liked. J was laughing uproariously. My personal favorite moment was the fleeting homage to The Love Boat–see if you notice it. I hope you all had a wonderful 4th of July. Your orthodontist sounds really cool! I don’t think my son is going to need orthodontia, but if he does I might pick your brain for a recommendation. @Claire, we like him. We visited 3 in our quest to find a provider, and we liked that he allowed us to procrastinate! Good luck with your son’s teeth.